Silicon Labs CEO Tyson Tuttle receives ASPENCORE WEAA Executive of the Year Award. Tyson Tuttle (left) and Yorbe Zhang, Head of ASPENCORE APAC (right). 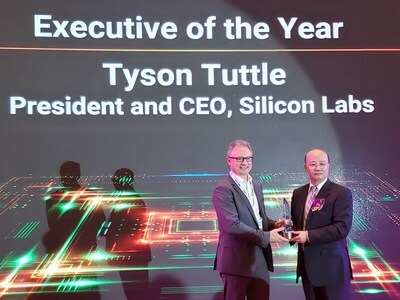 AUSTIN, Texas, Nov. 12, 2018 /PRNewswire/ -- Tyson Tuttle, CEO of Silicon Labs (NASDAQ: SLAB), won recognition as Executive of the Year at the 2018 ASPENCORE World Electronics Achievement Awards (WEAA) on Nov. 8 in Shenzhen, China. ASPENCORE, a premier electronics industry media network, announced the WEAA awards at its first annual Global CEO Summit where Mr. Tuttle presented a keynote on how integrated hardware and software platforms and industry collaboration will advance the Internet of Things (IoT). The Silicon Labs EFR32 Wireless Gecko also won top honors as the WEAA's Product of the Year in the RF/Wireless/Microwave category. Wireless Gecko devices provide IoT developers with the multiprotocol capabilities, design flexibility, simplicity and security needed for a wide range of smart, connected applications. "Tyson is a lifelong engineer and IoT evangelist. He recognized more than eight years ago the emerging opportunity of the Internet of Things within the semiconductor industry, and set Silicon Labs on a trajectory to become a key innovator in the IoT," said Yorbe Zhang, Head of ASPENCORE APAC and Chair of the WEAA judging panel. "As CEO, Tyson is transforming Silicon Labs into a leading provider of IoT connectivity solutions, with more than half of the company's revenue now stemming from the IoT. He plays an important role in delivering the silicon, software and solutions that enable the connection of things, information and people everywhere." Mr. Tuttle joined Silicon Labs in 1997 and has been instrumental in shaping the company's strategic and technological direction. After becoming CEO in 2012, Mr. Tuttle laid the foundation for a cultural shift to serve broad-based markets with a greater emphasis on software and tools, enabling customers to simplify IoT system design. He also created a vision for the industry's first "IoT SoCs," which led to the development of the Wireless Gecko portfolio. "I'm deeply honored to receive ASPENCORE's first WEAA Executive of the Year award," said Tyson Tuttle, CEO of Silicon Labs. "It's equally satisfying that Wireless Gecko, Silicon Labs' flagship portfolio for the IoT, also won Product of the Year, underscoring the value our wireless connectivity solutions bring to customers worldwide." ASPENCORE's WEAA program honors companies, executives and technologies that have made outstanding contributions to innovations and development in the global electronics industry. Winners are selected by a judging panel comprising ASPENCORE editors in Asia and the US, as well as through online voting by engineers around the world. The ASPENCORE media network includes EE Times, EDN, EBN, Electronic Products and other technology publications. ASPENCORE is a division of Arrow Electronics created to operate independent, multinational media channels within the technical electronics sector. The sole mission of ASPENCORE is to provide the highest quality content to electronics engineers and technical practitioners in order to aid them in innovation, thus helping to spur growth of the entire electronics market. ASPENCORE channels also provide technology vendors with unique opportunities to influence engagement of technology decision makers.